Our group was founded in 1994 by amateur genealogists, members and former members of the Canadian section of the Genealogy Bulletin Board on the Prodigy on-line service. 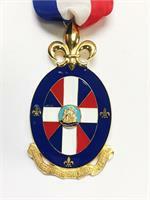 The purpose of La Société des Filles du roi et soldats du Carignan is to honor the memory of our courageous ancestors, the filles du roi (King's Daughters) and the soldiers of the Carignan-Salières Regiment of 17th-century New France. The society is an organization of volunteers and people interested in finding out more about their ancestors and the role they played in the development of New France and in promoting good genealogical practices. We wish to foster a sense of pride in our common French-Canadian heritage.